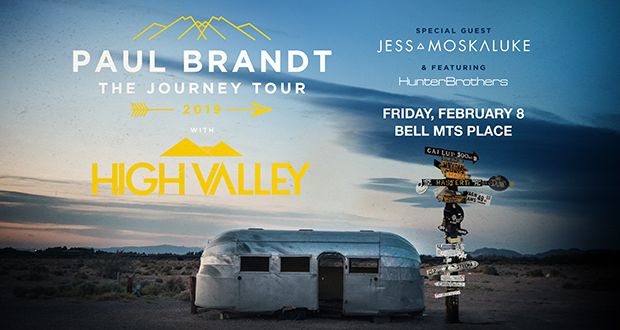 Canadian country music superstar Paul Brandt and multi-CCMA Group or Duo of the Year winners High Valley are thrilled to announce the launch of The Journey Tour 2019. The tour brings together an epic lineup that includes special guest Jess Moskaluke and features Hunter Brothers. Bringing together the best of Canadian Country Music, The Journey Tour 2019 will kick off in Abbotsford, British Columbia on January 25th, and wrap up 21 stops later in Sudbury, Ontario February 24th. Fans purchasing tickets for all but three of the shows will also receive a digital download copy of Paul Brandt’s new album The Journey BNA: Vol. 2.